The current rules may be found here. The Texas Association of Psychological Associates represents psychology practitioners licensed at the master's level. Licensed Psychological Associates provide a full range of psychological services, including assessment, consultation, and therapy. 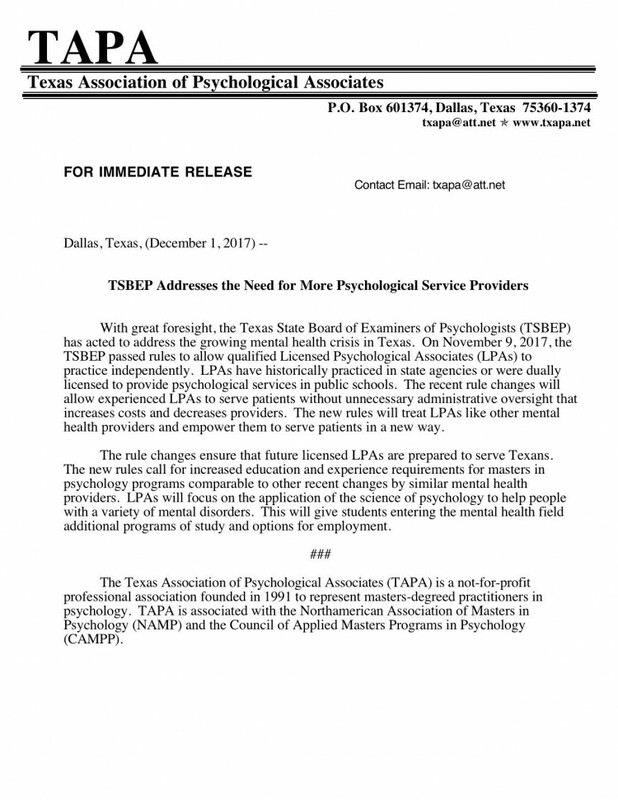 Psychological Associates have existed in Texas since the first law regulating psychology was passed over thirty years ago. 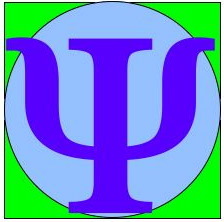 • To provide professional development and representation of Psychological Associates in Texas. • To provide information to all members on interesting new research and innovative practices. • To promote the provision of high quality, culturally sensitive mental health services to all segments of the population without regard to socio-economic status and in diverse and non-traditional settings. • To encourage communication and cooperation among all members of the mental health community. • To recognize the skills and expertise of all mental health practitioners. The TSBEP has passed rules giving Qualified LPAs Independent Practice! The Application has been posted on the TSBEP website which should be submitted by LPAs who do not currently meet the Qualifications, but who will do so in the future. Most "Qualified" LPAs have received new Licenses from the TSBEP. However, there are many Questions remaining as we work to take our place along with the LPCs, LMFTs and SWs. TAPA Is Working For YOU! Many of you who met the qualifications for Independent Practice will have received your NEW license from the TSBEP giving your Independent status. Please READ the letter that was enclosed. You must use the title licensed psychological associate or psychological associate when practicing under this license.You may NOT call yourself a licensed psychologist or psychologist. You remain subject to all of the Board's rules, including Board rule 463.8(f) pertaining to the required notification of patients and Board rule 465.9 relating to competency. You must exercise great care to ensure you continue practicing only within your area(s) of competency. You are encouraged to review Title 22, Part 21, Chapter 465 of the Texas Administrative Code (i.e. the Board rules governing the rules of practice) to ensure you have a thorough understanding of those rules before engaging in independent practice. An interesting article entitled "Texans Will Benefit When Psychologists Are Pushed From Their Safe Space," authored by Mary Lou Serafine, can be found here or the text can be found here. She is the attorney whose suit against the TSBEP resulted in their definition of psychology being declared unconstitutional because it was too broad and in it being rewritten. The Governor has made available this video prepared by the Attorney General's Office on human trafficking. The video is approximately 52 minutes long, but is worth watching. Governor Greg Abbott and Attorney General Ken Paxton have joined forces to put together a training video teaching state employees how to recognize and report suspected human trafficking. The TSBEP would like to take this opportunity to provide its licensees, applicants, and members of the public with a link to this video and training as well. The training video entitled Be the One in the Fight Against Human Trafficking, along with other related training information, can be found by clicking here. The Strategy or the preventive direction or actions to achieve the goal of preventing suicide. The Approach—including the specific ways to advance the strategy.